Lisbon Airport is the primary international gateway to Portugal. On 15 October 1942, Lisbon Airport opened and was used by German and British airlines. During World War II, as a neutral airport, it was a hub for smuggling people, into, out of, and around Europe. Lisbon Airport (IATA code: LIS) is one of the most important European hubs to Africa, and it is the main hub of TAP Portugal. Flights to Lisbon Airport are provided by Emirates, KLM and Etihad Airways. LIS is a 15-minute drive from the city centre of Lisbon. Book your cheap flights to and from Lisbon Airport online! Lisbon Airport is the busiest airport in Portugal and continues to expand. Run by ANA – Aeroportos de Portugal, Lisbon Airport served 22.4 million passengers in 2016. The airport has all the amenities needed by tourists in transit. Lisbon Airport has two terminals with plenty of opportunities to shop for amazing items. Be sure not to get carried away and miss your flight! Lisbon Airport has several restaurants where passengers can grab a meal before catching their flight. You will also find snack bars, cafés and fast food outlets in the departures area. Shops at Lisbon Airport affords you access to duty free shopping. Shops to be found at Lisbon Airport include book stores, souvenirs, jewellery and clothing. 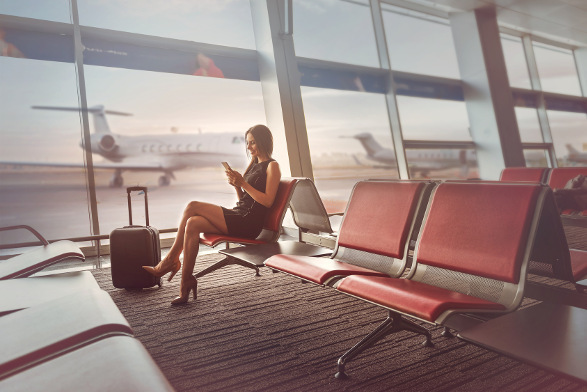 The Lisbon Airport international departures has luxurious lounges for passengers to occupy before their flight, including ANA lounge, Blue Lounge and TAP Premium Lounge. Conveniently located close to the city centre, and a 10-minute drive from Lisbon Airport, this hotel is the perfect accommodation for travellers. Amenities include parking, Wi-Fi, a gym, a coffee shop and meeting rooms. This elegant hotel is the ideal accommodation when visiting the city of Lisbon. It is a 10 -minute drive from Lisbon Marriott Hotel. Amenities include a pool, a fitness centre and meeting rooms. Enjoy contemporary accommodation at Tivoli Oriente Hotel. It is a 10-minute drive from Lisbon Airport. Amenities include free Wi-Fi, a business centre, a fitness centre, a sauna and pools. There are bureau de change services in the departures and arrivals areas. Travellers can order foreign exchange 60 days in advance. Lisbon Airport is located 7 km north of the city centre of Lisbon. Metered taxis, metro, bus, car hire and airport shuttles are available to transport you from the airport to your destination.